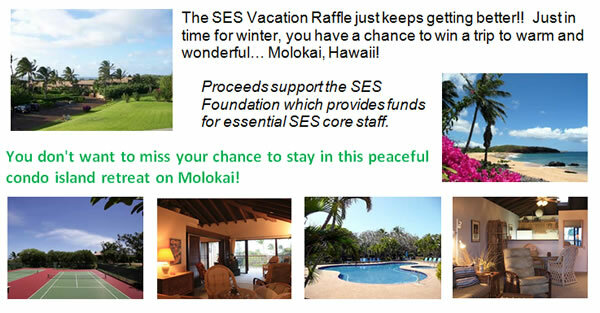 The SES Vacation Raffle just keeps getting better! !Â Â 7 days and 7 nights on beautiful Molokai, Hawaii â€“ a very quiet island. 2 bedroom/2 bath condo, with sleeping loft â€“ can sleep 6-8 comfortably. Ocean view condo includes internet, washer and dryer, fully furnished. Click here to view more information about this wonderful vacation home. Ready to buy your raffle tickets? Fill out the form below or stop at the table at school M/W/F mornings until December 6th.